Woodford Patient Capital invests in early stage UK companies which the manager believes have the potential for significant upside, aiming to produce long-term capital growth in excess of 10% per annum. 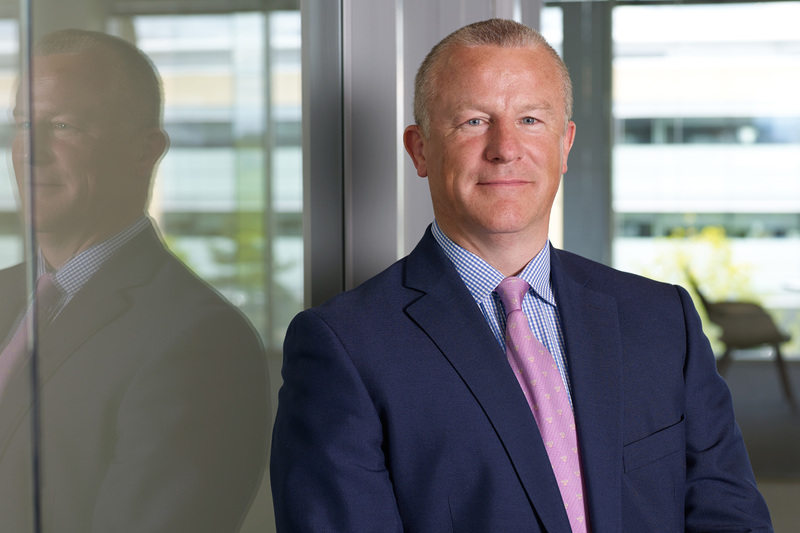 The trust is managed by Neil Woodford, one of the best known fund managers in the UK during his time at Invesco. The trust's strategy does differ to Neil’s more established portfolios, however, with the manager better known for running large-cap biased, income-orientated open and closed-ended vehicles. The manager has always taken a keen interest in companies in the early stage of their development, though, and this trust was launched to provide capital to businesses Neil believes will be the winners of the future. 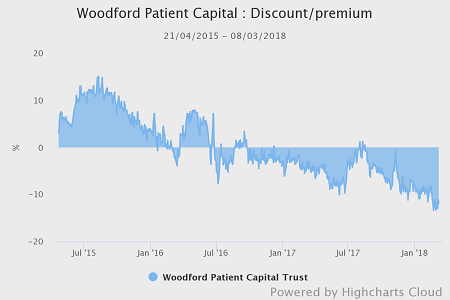 Given the manager’s popularity, Woodford Patient Capital was launched to great fanfare and, consequently, at its peak it reached a great size (+£900m), as well as trading on a premium as high as 11.5% in the period since it was launched in April 2015. However, despite its successful launch, the trust has endured somewhat of a difficult period for most of its short life so far. Its NAV returns had been relatively dull compared to both its peers in the AIC UK All Companies sector and the wider UK equity market and, combined with relatively poor sentiment towards smaller companies thanks to Brexit uncertainty as well as a few notable stock specific issues, the trust’s premium to NAV has fallen away to a wide discount. The trust has had a rocky start to 2018, with the NAV down 5.6% and share price down nearly 10%. This brings NAV total returns over 12 months to 28 February of -11.0%, putting it behind the FTSE All Share. This poor performance has led to the discount widening to -11.8% at the time of writing (March 2018). It is worth noting that the portfolio is very different to the FTSE All Share, and so will likely continue to perform in a very different way to the index. Neil has been adding to gearing, which now stands at 22%, which when combined with the underlying strategy means that the trust is perhaps not for the faint-hearted. The investment approach emphasises that time is required to deliver the sorts of long-term returns aimed for at launch. The trust’s performance to date has been poor, and the press has not displayed much of this ‘patience’. However, there is no escaping the fact that this is a well-known entity to retail investors and, as such, the future direction of the discount will be heavily tied (and highly-sensitive) to Woodford Patient Capital’s underlying NAV performance. 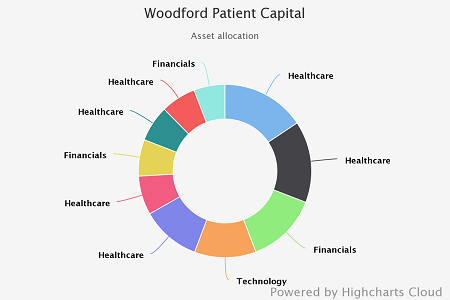 Woodford Patient Capital is relatively diversified in terms of number of holdings (85), though concentrated when it comes to individual stocks - the top 10 holdings account for 62.46% of NAV. This is very much a bottom-up, growth-orientated approach with Neil’s aim being to invest in early stage/young companies and hold them for the long term. 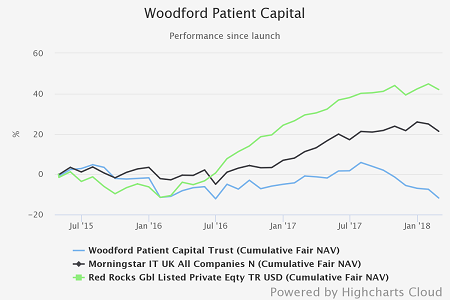 As such, while some of the portfolio's holdings do feature in Neil’s highly-popular UK equity income funds, Woodford Patient Capital still only has 14% crossover with CF Woodford Equity Income. The reason behind launching the trust was that Neil and the team felt there are many exciting, disruptive companies in the UK with strong intellectual property, but historically few had been turned into commercial successes thanks to a lack of appropriate capital investment. As such, the investment strategy revolves around finding early stage/early growth companies and, by providing long-term ‘patient’ capital, helping those businesses fulfill their potential. The portfolio is run with no reference to a benchmark, with the process heavily reliant on the team’s own fundamental company research. Also, given the trust’s investment objective and therefore the type of companies it invests in, a cornerstone of the process is to meet and closely work with company management to try and help drive shareholder value. The manager invests in companies where he believes there is significant potential upside, usually through proprietary intellectual property, and often invests alongside experienced players in this field such as IP Group, Allied Minds and Imperial Innovations. This process is borne out in the types of companies the trust holds, as a significant portion of the portfolio is in unquoted stocks. Despite the long-term growth focus, however, the trust also includes a significant weighting toward mid/large cap companies. From a sector point of view, the trust is heavily biased towards healthcare/biotech companies. Indeed, healthcare makes up 66.14% of the portfolio, with the next largest sector exposures being financials at 26.77% and technology which has doubled from 7.12% to 14.77%. As with Neil’s highly popular equity income funds, Woodford Patient Capital has next to no exposure to commodity-related stocks. In regional terms, the trust is dominated by UK exposure, which makes up 92.2% of its total net assets, while the US is its only other significant regional holding at 20.0%. The portfolio follows specific investment restrictions, for example, the cap on unquoted stocks is 80%, while the portfolio must have a minimum of 40 holdings. Additionally, there is no restriction on overseas stocks, although the team state the portfolio will remain UK focused. The limit for single stock exposure sits at 20%, but this has no restrictions when it comes to exposures to types of companies – which had previously stood at 25% for early growth, 50% for early stage and 25% for mid- and large-caps. According to the board, this helps enable “greater flexibility to capture growth and follow-on investment opportunities”. The board does not intend to deploy long-term gearing, but the trust can have gearing of up to 20% of NAV. As of the end of February 2018, gearing stands at 22% (up from 9% the start of 2017). Neil Woodford is probably the most famous name in UK fund management thanks to his success at the helm of Invesco's income funds during his tenure there, and the performance of Woodford Patient Capital (his first attempt at this sort of strategy) has been monitored closely by investors and the press alike. The trust has struggled relative to its peers in the AIC UK All Companies sector and the FTSE All Share. Since its launch in April 2015, its NAV total returns have been -11.8% compared to returns of 16.5% from the FTSE All Share index. However, the trust looks nothing like the FTSE All Share index so its relative performance is always likely to differ from the wider market – though Neil himself has admitted his frustration at the trust’s relative returns. The trust enjoyed decent returns during its first few months as Neil became gradually more invested, but endured a very difficult 2016 & 2017. Its NAV fell -2.1% last year as the FTSE All Share index rallied 12.9%, with the portfolio’s significant exposure to small UK businesses weighing heavily in a market rife with Brexit uncertainty. Performance since the new year has fallen -5.6% in NAV terms, but with the discount widening out and the shares down 10% over 2018 so far, the pain has been exacerbated for shareholders. Though the backdrop for the investment approach hasn’t been particularly conducive, there have also been a number of stock specific disappointments such as Prothena Corp, which has dropped in price by -35.0% over the 12 months to the time of writing. However, it hasn’t all been bad news. Some of its strongest contributors include Purplebricks, which has increased price by c. 200% over the course of 2017 and is now the trust’s fourth largest holding, as well as Arix Bioscience PLC and Theravance Biopharma Inc, both of which have performed well since the new year, returning 12.0% and 10.3% over 2018 so far. A surprise bonus for those who were invested in the trust in 2015 was a dividend of 0.16p per share, paid because the trust's portfolio generated unexpected income (which must be distributed according to the rules governing investment trusts). The manager is clear that there is no intention to maintain dividends for the trust, and investors should not expect them in the future. Neil Woodford is one of the best-known managers in the UK. Prior to setting up Woodford Investment Management, where he is head of investment, he was part of the UK equities team at Invesco for more than 26 years, winning great acclaim as manager of the Invesco Income and High Income funds, and Edinburgh Investment Trust, one of the largest and oldest investment trusts in the UK. Neil is supported by three other fund managers and they are also supported by three specialist analysts. Thanks to Neil’s huge retail following, the trust’s shares jumped to a large premium following its IPO – reaching as far as 15%. The board had been very active in issuing shares to grow the trust and its relatively poor NAV returns have meant the discount had waned considerably throughout the second half of 2017. 2018 has so far brought no new year joy for Woodford, with the shares trading on a discount of -11.7% at the time of writing (March 2018). Unusually, the trust does not have an annual management charge, making it difficult to compare with its peers in terms of ongoing charges. The trust instead uses a performance fee, taking 15% of any NAV outperformance beyond a minimum hurdle of a positive return of 10% per annum. This fee uses a ‘high watermark’ meaning if, for example, it was to lose 5% in one year, it would have to make 15% in the following year to hit the point where the performance fee was payable. The trust's other ongoing annual expenses add up to 0.17% pa.